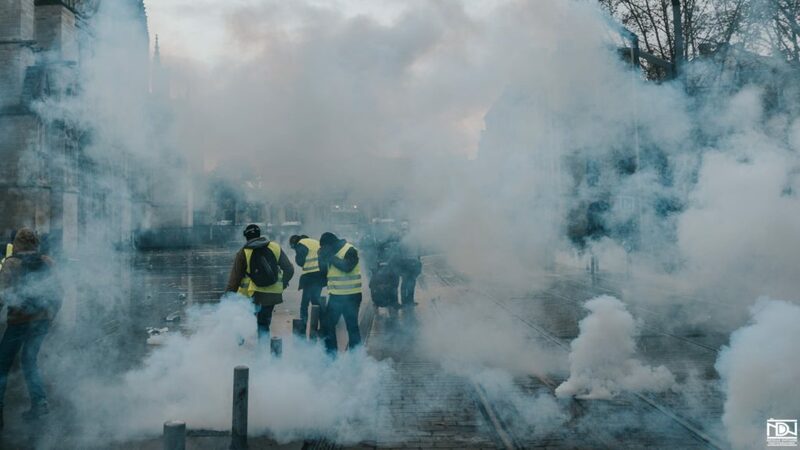 Journalists say that Macron thought the movement would fade away after the end-of-year break; that police violence and desperation would induce the demonstrators to resign themselves to their fates, and that the support of the general population would collapse. Nothing of the sort took place. Macron wrote a letter to all French citizens inviting them to “participate”, but sayingexplicitly that the “debate” would not change anything, that the government would continue in exactly the same direction (“I have not forgotten that I was elected on a project, on major orientations to which I remain faithful.”), and that everything that was done by the government since June 2017 would remain unchanged (“We will not go back on the measures we have taken”). He then entrusted organizing the “debate” and drafting its conclusions to two membersof the government, and requested that “registers of grievances” be made available to the public in all town halls. The first two meetings took place in small cities (with 2000-3000 inhabitants), and with mayors whom the organizers — chosen by Macron — allowed to come. The organizers also selected the questions to be asked, then sent them to Macron to be answered at the meeting. The French economy is, in fact, sclerotic. The Index of Economic Freedom created by the Heritage Foundation and the Wall Street Journal ranks it 71st in the world (35th among the 44 countries in the Europe region) and notes that “the government spending accounts for more than half of total domestic output”. The Index also reveals that “the budget has been chronically in deficit”; that “corruption remains a problem and that “the labor market is burdened with rigid regulations” leading to a high level of unemployment. France has lost almost all its factories (industrial jobs account for only 9.6% of total employment). Its agriculture is in ruins, despite huge European subsidies: 30% percent of French farmers earn less than 350 euros ($400) a month and dozens commit suicideeach year. In the high-tech sector, France is essentially absent. Guilluy, a geographer, published two books: La France périphérique (“Peripheral France”) in 2014, and, just weeks before the outbreak of the uprising, No society. La fin de la classe moyenne occidentale (“No Society. The End of the Western Middle Class”). In them, he explains that French population today is divided into three groups. The first group is a ruling upper class, totally integrated into globalization, made up of technocrats, politicians, senior civil servants, executives working for multinational companies, and journalists working for the mainstream media. The members of this class live in Paris and the main cities of France. In a recent interview on the British web magazine Spiked, Guilluy said that the “yellow vests” movement is a desperate awakening of “peripheral France”. He predicted that despite Macron’s efforts to displace the problem, the awakening will last, and that either Macron “will recognize the existence of these people, or he will have to opt for a soft totalitarianism”. “He must make decisions and he can no longer take any decision without making things much worse… Macron should agree to resign, but will not do it, and would prefer to go to the end, and hit a wall… The next three years will be hell for the yellow vests and for the French”. At the end of the protests in Paris on January 26, thousands of “yellow vests” had planned to gather peacefully on one of the main squares of the city, the Place de la République, for a “debate” and to provide responses to the “debate” organized by Macron. The police were ordered to disperse them brutally; they once again used rubber ball launchers and Sting-Ball grenades to do just that. One of the leaders of the “yellow vests” movement, Jerome Rodrigues, was shot in the face while filming police officers in a square nearby, the Place de la Bastille. He lost an eye and for several days was hospitalized. Other protestors were wounded. In the spring of 2016, leftists had organized debates in the same locations and were allowed to remain there for three months with no police intervention. In an article describing the events of January 26, columnist Ivan Rioufol wrote in Le Figaro: “Repression seems to be the only argument of the caste in power, faced with a large-scale protest that will not weaken”. “In 2005, the police were clearly the target of rioters, and they showed restraint in the use of force to bring down the violence. Today, most of those who protest do not attack the police. But instead of acting to bring down the violence, the police are receiving orders pushing them to be very violent. I do not blame the police. I blame those who give them orders”. The next day, Sunday, January 27, a demonstration was organized by Macron’s supporters, who called themselves “the red scarves“. The demonstration was supposed to show that an impressive number of people were still on Macron’s side. Organizers said that ten thousand people came. Videos, however, show that the number seems to have been far lower. EDIT: Is it not time to have a revolution in France and a covert team to take out Macron? You choose, send emails to your heads of government wherever you are and try and get a conclusion of the “French problem”. If it was a “problem” for the USA, Macron would have been assassinated by now and a new government formed.